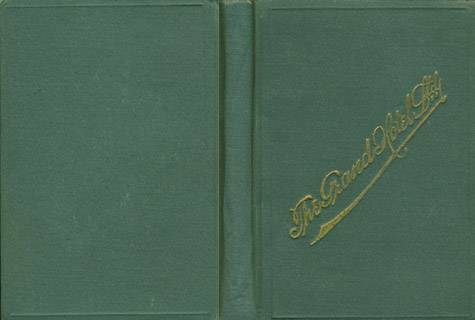 The Grand Hotel, Limited, Guide Book for Yokohama and Immediate Vicinity, not dated but ca 1898, green cloth over pliable boards, "The Grand hotel Ltd" in gilt on front cover, small 32mo (3 1/2 x 5 in - 9 x 12.7 cm), 5 black and white double page halftone plates in text showing views of the hotel, 4 black and white double page halftone advertisement plates, 63 numbered pages of guide book, 26 numbered pages of "Anglo-Japanese Conversation," 52 unnumbered pages of advertisements (including ads on the front and back paste downs), color folding map (plan)of Yokohama in a pocket behind the back paste down page, a total of 141 pages and an additional 18 pages of plates (9 double page plates printed one side only), 159 pages total and a map (plan). The text is divided into two sections with numbered pages. The page numbering starts with 1 in both sections. First Section (pages 1-63). This is the guide book for Yokohama and the vicinity. 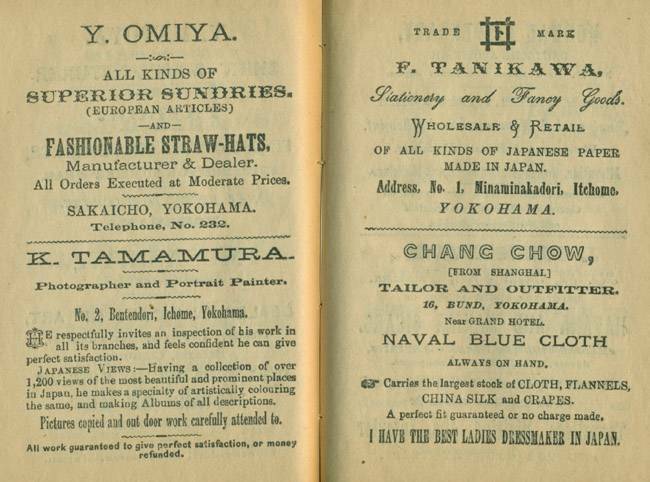 It includes major sections on consulates, Japanese governmental offices, hospitals, shrines, theaters, gardener's associations, art industries and sights in the vicinity of Yokohama. This section concludes with appendices with tables of fares, money, weights and measures and a festival calendar. Second Section (pages 1-26). 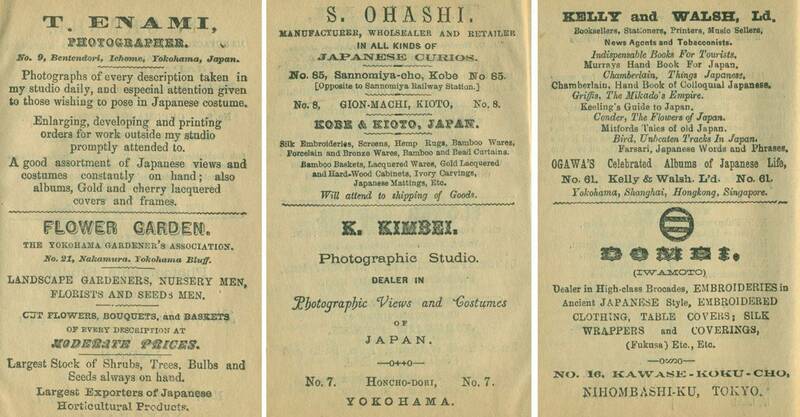 This section is titled "Anglo-Japanese Conversation for Tourists." It includes conversational words and phrases (English and Japanese equivalent) regarding numbers, salutations, conversation for travelers, weather, personal effects, "Engaging a Jinrikisha," and conversations "At a Hotel," "At a Railway Station," and "At a Store." The book has no colophon and is undated. The latest date referenced in the text pages is 1889. I find no dates in the advertisements. 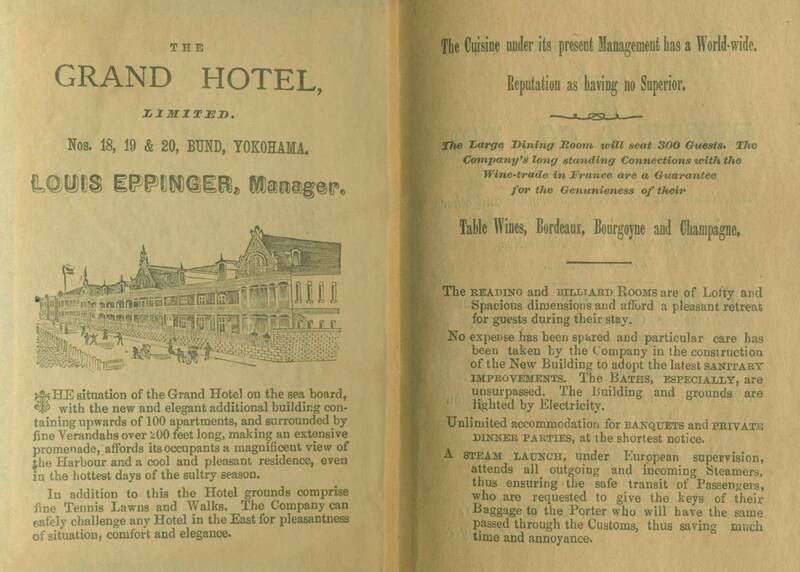 I have dated this book ca 1898 because of the reference to Louis Eppinger as the manager of the Grand Hotel. He occupied this position form 1891 to 1905. The approximate date of ca 1898 represents the mid-point of his tenure. 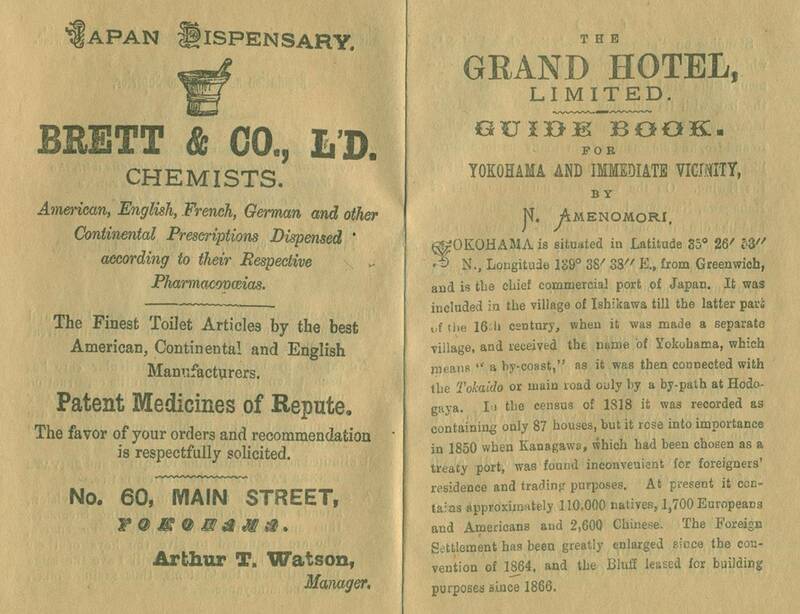 It is not unusual to see books of this type dated 1892. However, since that is only an approximation, I have used a more conservative approach. 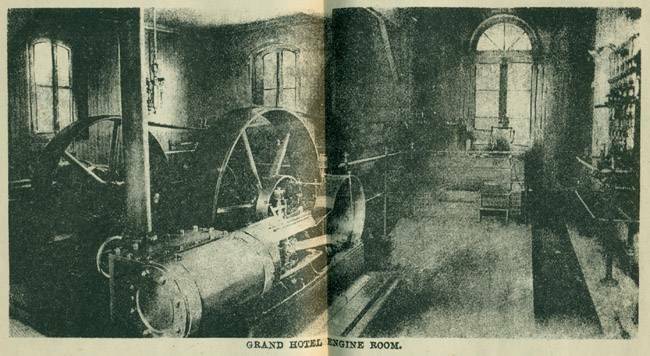 Over the years several Grand Hotel Guide Books were published. Unfortunately, they do not contain a colophon and generally there is no indication of the date of publication. The date of publication, therefore, must be approximated by a review of the contents (text, advertisements and maps/plans). 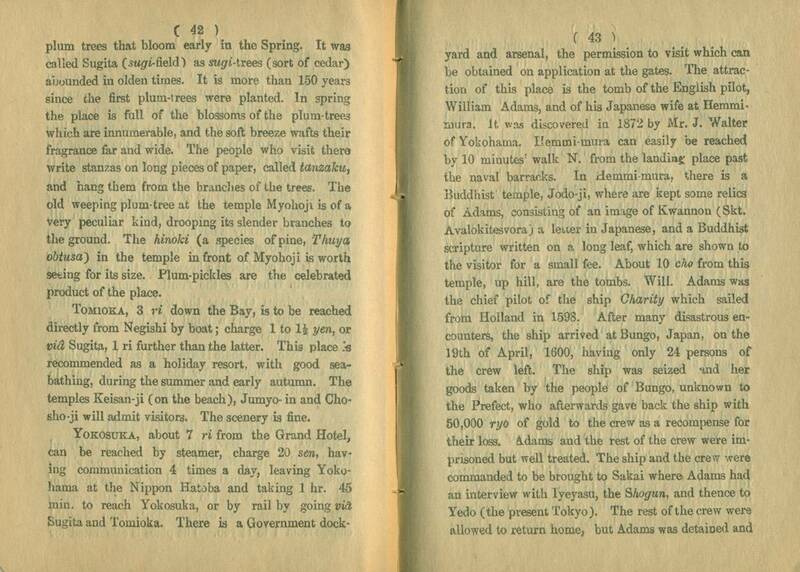 The following chronology relating to Yokohama and the Grand Hotel may be useful in dating a guidebooks. 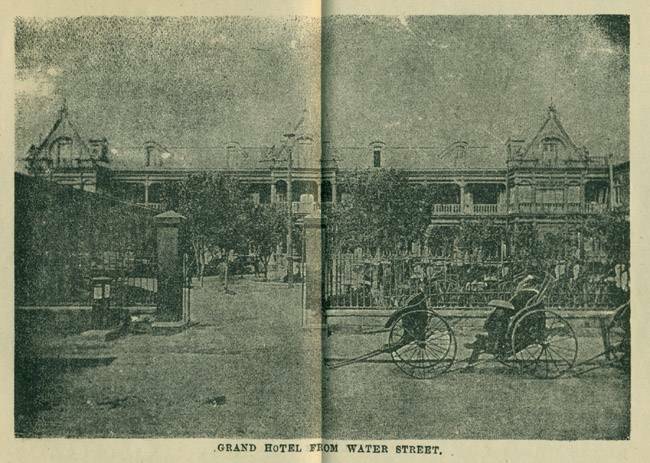 1873, August - The Grand Hotel opened. It was a two story brick building with only 10 rooms located at the corner of No. 20 Bund. This was at the east end of the street and adjacent to the Horikawa Waterway which was spanned by Yatobashi, an iron bridge. It is believed to have been designed by an American architect, Richard P. Bridgens. Early photographs show a two story brick building with 9 windows per floor on the side facing the Bund and approximately 10-12 windows per floor on the other side. Photographs of the original small structure alone are seldom seen. Some photographs show a separate brick building on Water Street behind the original building (12 windows on Water Street side and 4 windows on the canal side). This was later joined to the original building forming an "L" brick wing (approximately 4 more windows added). With the joining of the buildings, this "L" shape wing now extended down the waterway side (approximately 8 windows) and up Water Street (12 windows). 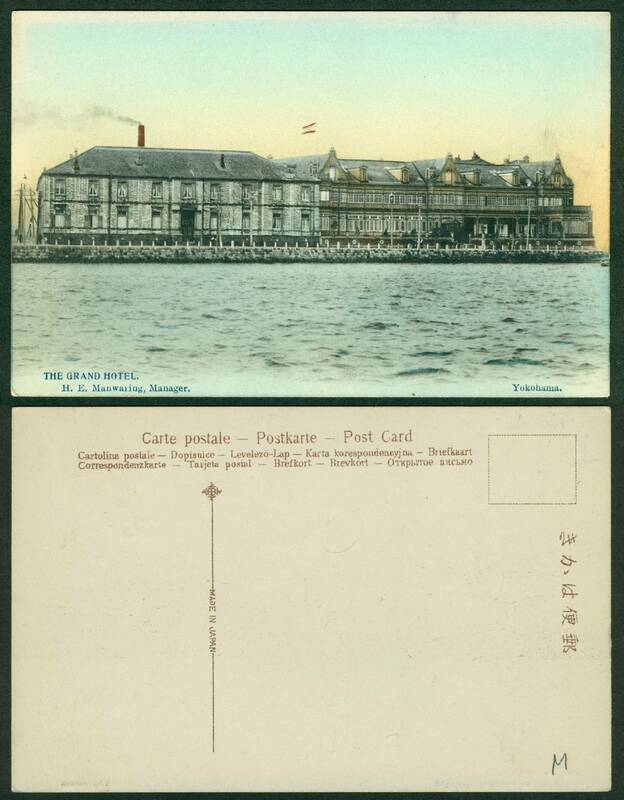 1890 - The hotel was greatly expanded by the addition of a large wooden annex with over 100 rooms occupying the better part of the block along the Bund. This new section of the hotel, designed by Pierre Sarda, was set back from the Bund with sufficient space for a lawn. 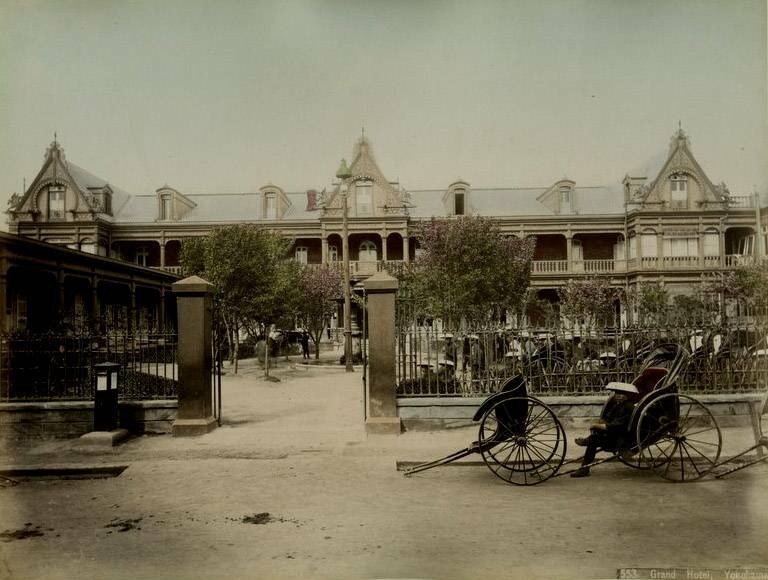 It had a large veranda, rail lined terraces and a gabled roof ornamented with winged horses. The expanded hotel complex occupied Nos. 18-20 Bund. The back of the hotel faced Water Street. 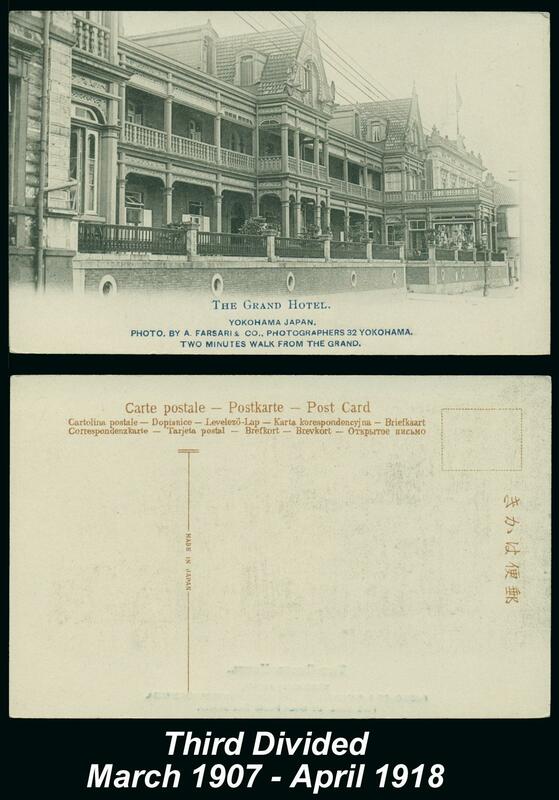 This is the hotel generally seen in the tourist trade albumen photographs from the late 1890s and the picture post cards of the early 1900s. 1891-1905 - Louis Eppinger was the manager of the Grand Hotel. 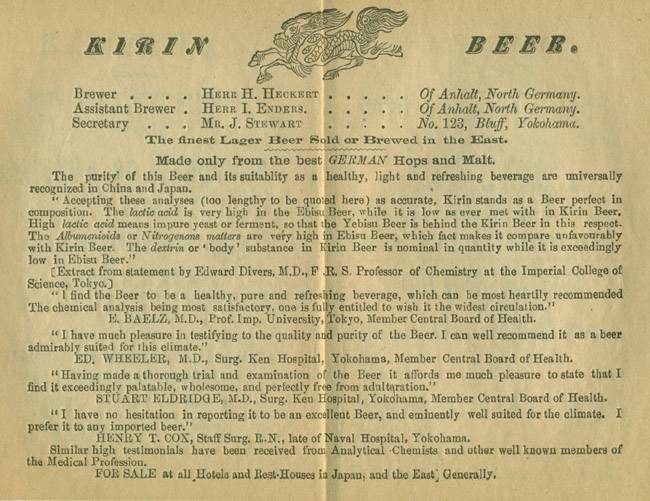 1894 - Wenckstern first notes the Grand Hotel's Yokohama guidebook in Volume II of his Bibliography of the Japanese Empire which covers the period from 1894-1906 (See Wenckstern, Vol II at page 406). No date for the guidebook is given. 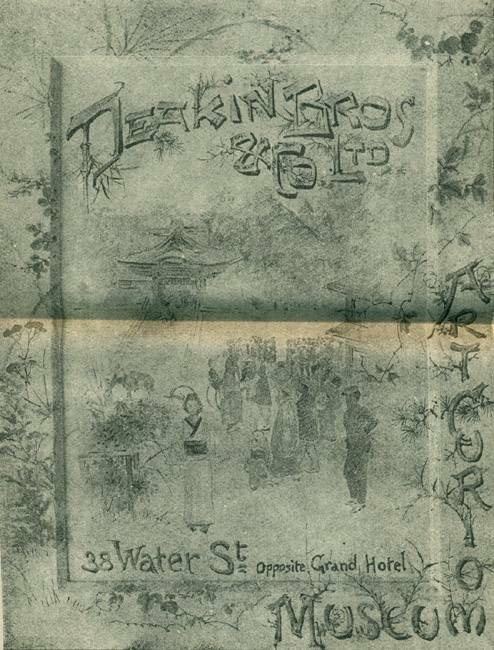 1894, June 20 - The Great earthquake of 1894 did not appear to cause significant damage to the hotel although buildings in the immediate vicinity, like Deakin Bros. Ltd. across Water Street from the Grand, were damaged. 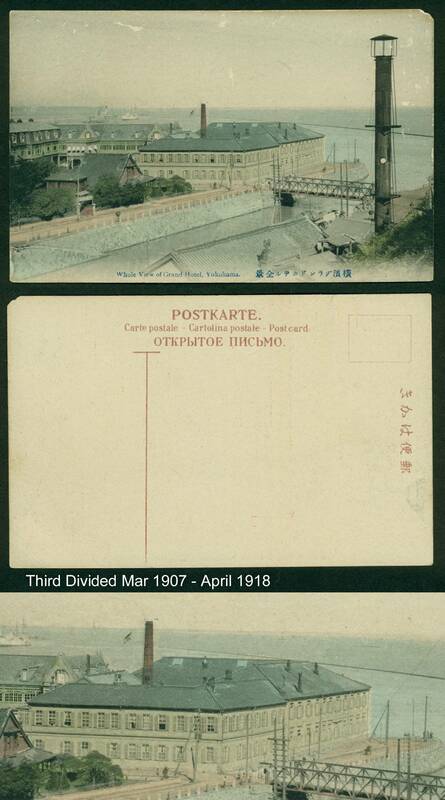 1894-6 - Construction on the Yokohama Harbor project adjacent to the Customs House on the Bund was completed. 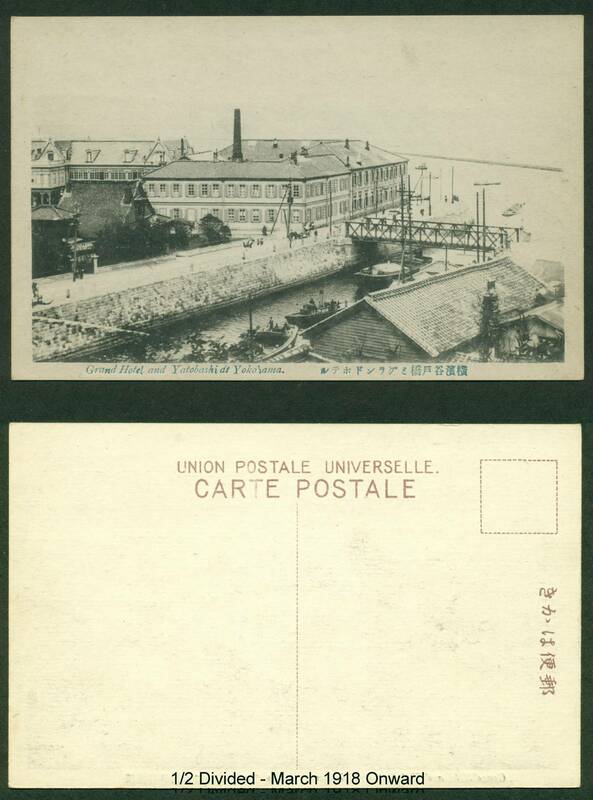 The Osambashi Pier was completed in 1894 and the entire harbor project was finished by 1896. The new pier was located in the area know as the English Habota (pier). 1899 - Extra-territoriality jurisdiction for foreigners abolished and they were subject to Japanese law and not the jurisdiction of the Consular Court of their own country. The exact transition date was July 17, 1899. 1904 - The Yokohama Railway (a streetcar line) began service. 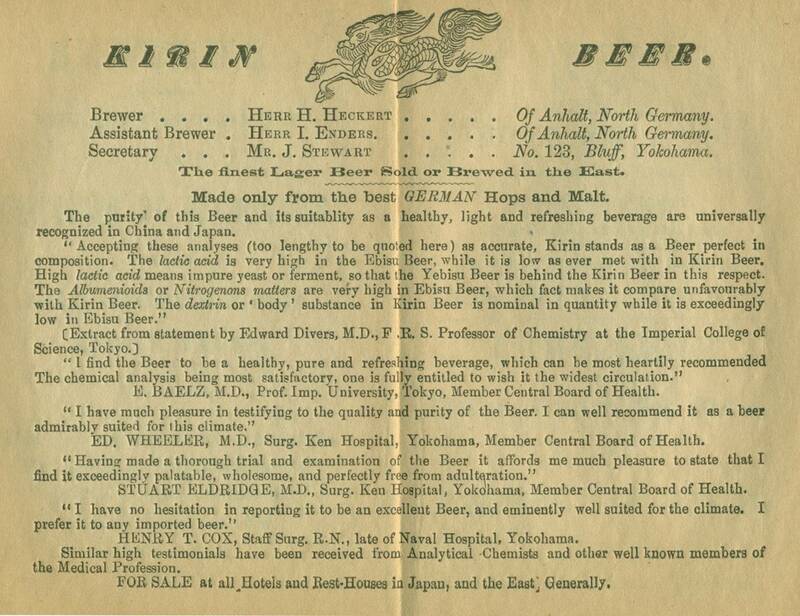 1906 - H.E. 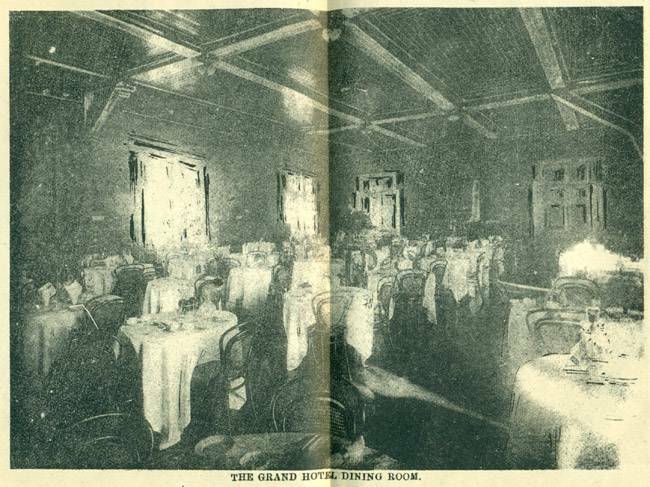 Manwaring became the manager of the Grand Hotel. He held this position at least through January 1912 and perhaps until c1920 when A.K. Bennett became the manager. 1906-7 - Louis Eppinger was a director of the Grand Hotel. 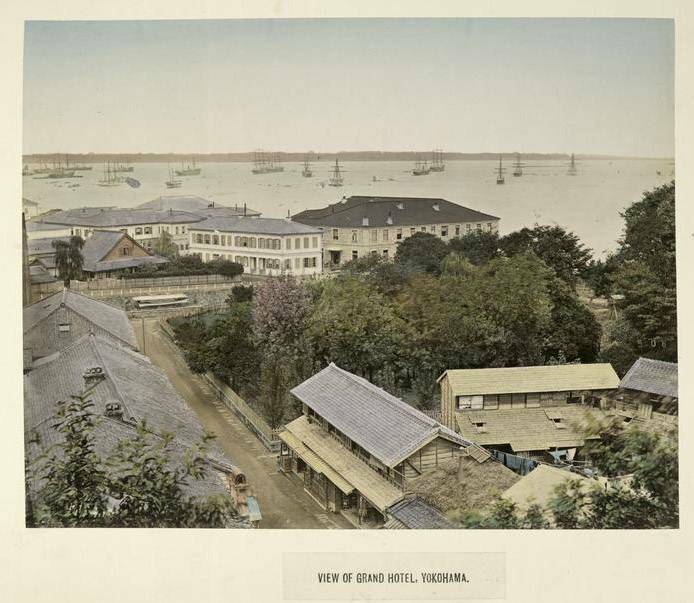 1906- - A nine hole golf course was opened at the Negishi racetrack in Yokohama. c1920- - A.K. Bennett becomes the manager of the Grand Hotel. 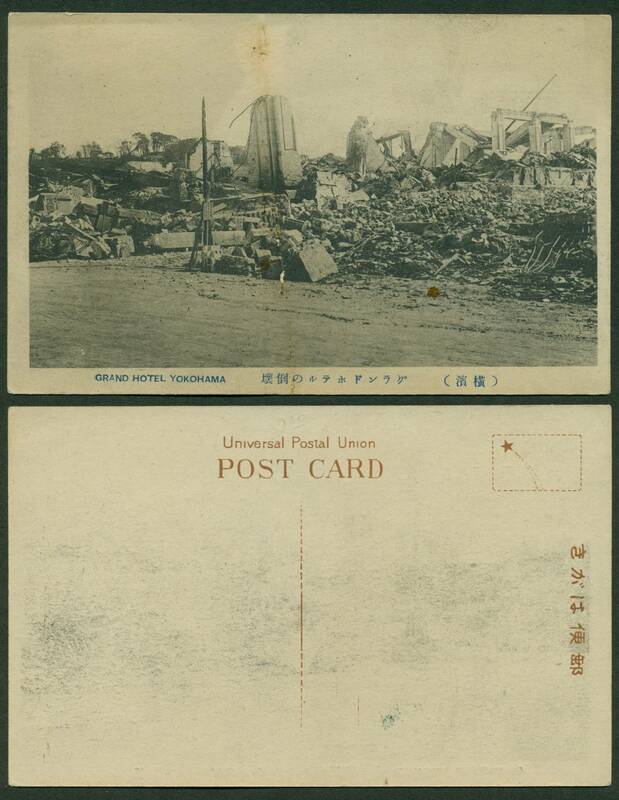 1923, September 1 - The Grand Hotel was totally destroyed in the Great Kanto Earthquake and the associated tsunamis. 1927, December 1 - The New Grand Hotel opened at a slightly different location. 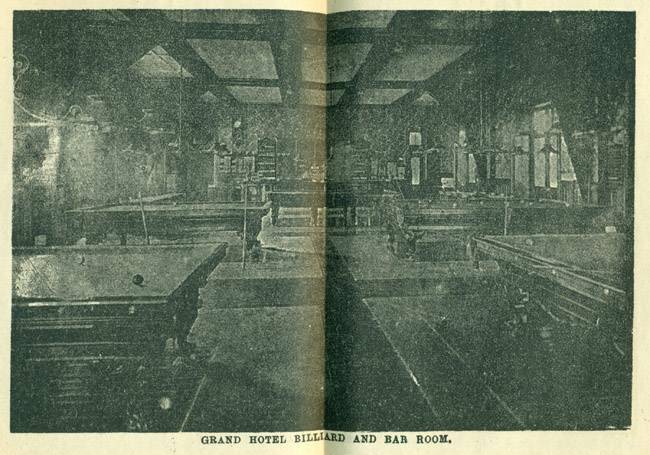 The following Grand Hotel Guide Books are recorded. Unless there is a link to the book, the information is based upon published listings and not personal examination of the book. 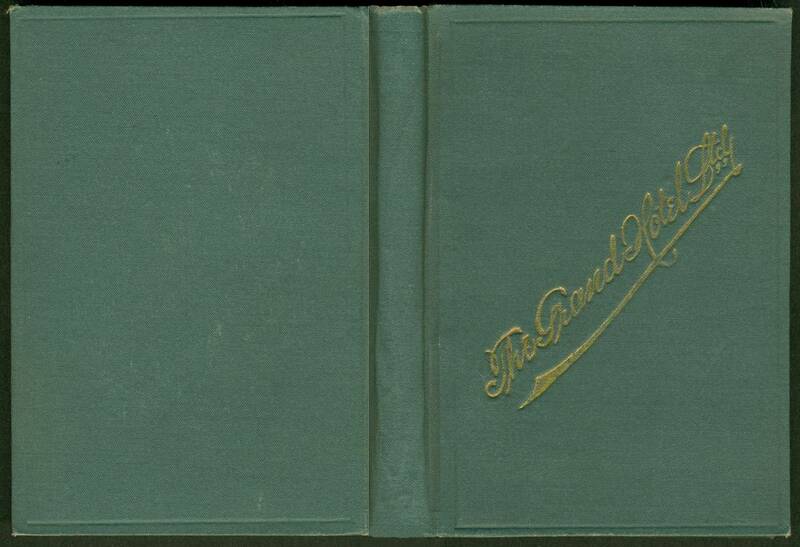 ca 1898, N. Amenomori, The Grand Hotel, Limited, Guide Book for Yokohama and Immediate Vicinity, not dated but ca 1898, green cloth over pliable boards, "The Grand hotel Ltd" in gilt on front cover, small 32mo (pocket size, 3 1/2 x 5 in - 9 x 12.7 cm), 5 black and white double page halftone plates in text, 4 black and white double page halftone advertisement plates, 63 numbered pages of guide book, 26 numbered pages of "Anglo-Japanese Conversation," 52 unnumbered pages of advertisements (including ads on the front and back paste downs), color folding map (plan) in pocket behind back paste down page, a total of 141 pages and an additional 18 pages of plates (9 double page plates printed one side only), 159 pages total and a map. More information here. 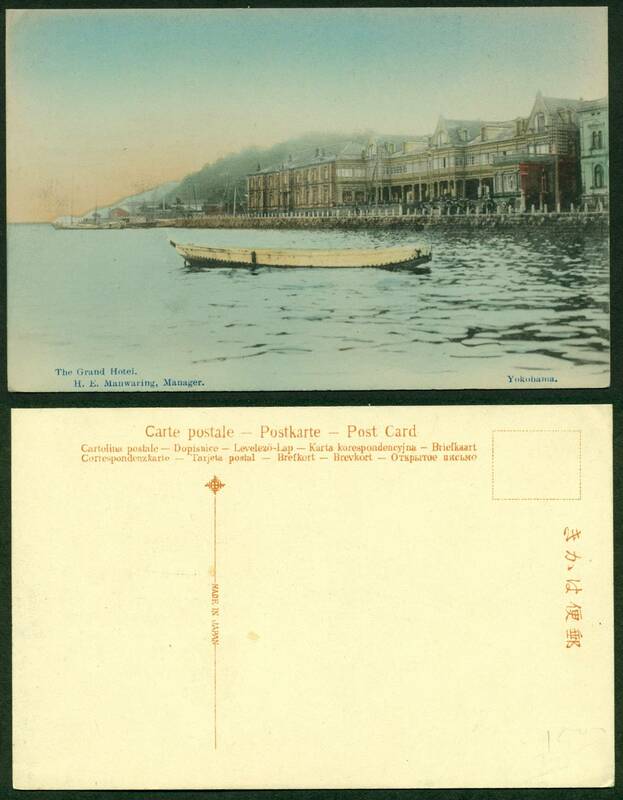 ca 1898, N. Amenomori, The Grand Hotel, Limited, Guide Book for Yokohama and Immediate Vicinity, not dated but ca 1898, burgundy cloth over thin flexible boards, gilt lettering on front cover and gilt design (drawing of the hotel) on back cover, small 32mo (pocket size, 3 5/8 x 4 3/4 in - 8.5 x 12 cm), 72 numbered pages of guide book, 26 numbered pages of "Anglo-Japanese Conversation," 34 unnumbered pages of advertisements, color folding map of Yokohama inserted loose, a total of 132 pages and a map. The map is printed (lithographed) by "The Box of Curios," Yokohama. There are no plates in this book. More information here. ca 1903, N. Amenomori, The Grand Hotel, Limited, Guide Book, 32mo, gray cloth over pliable boards, 94 pp + 23 pp. Advertisement for Pacific Mail ship built in 1902. No map or plan. 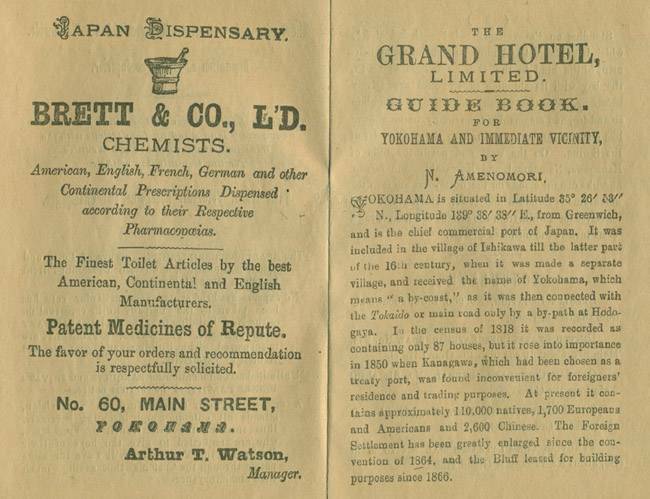 ca 1905, N. Amenomori, Yokohama and Vicinity, The Grand Hotel, Limited (title page), The Grand Hotel, Limited, Guide Book for Yokohama and Immediate Vicinity not dated but ca 1905, textured green cloth, "The Grand Hotel Ltd" and "Yokohama and Vicinity" in gilt on front cover, printed by the "Japan Gazette Press," 32mo (pocket size,4 1/4 x 5 1/2 in - 11 x 14.5 cm), no plates in text, 65 numbered pages of guide book, 18 numbered pages of "Anglo-Japanese Conversation or Tourists," 60 pages of advertisements, color fold-out plan of Yokohama tipped at the spine to the inside back cover. More information here. 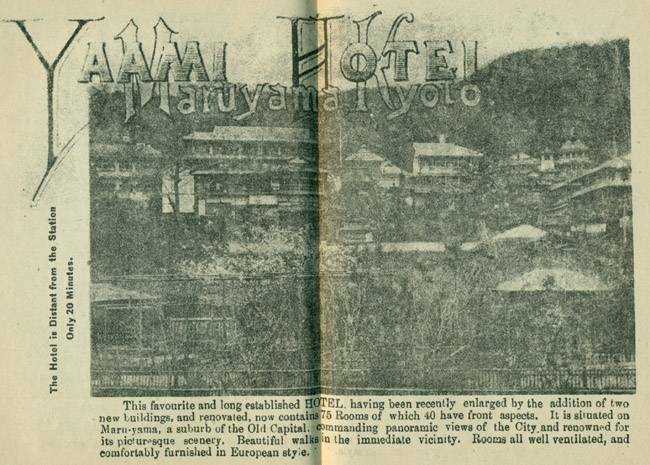 ca 1907, N. Amenomori, The Grand Hotel, Limited, Guide Book for Yokohama and Immediate Vicinity, Yokohama, "Japan Gazette" Press, color illustrated card wraps (hotel on front, Mt Fuji on back) with H.W. 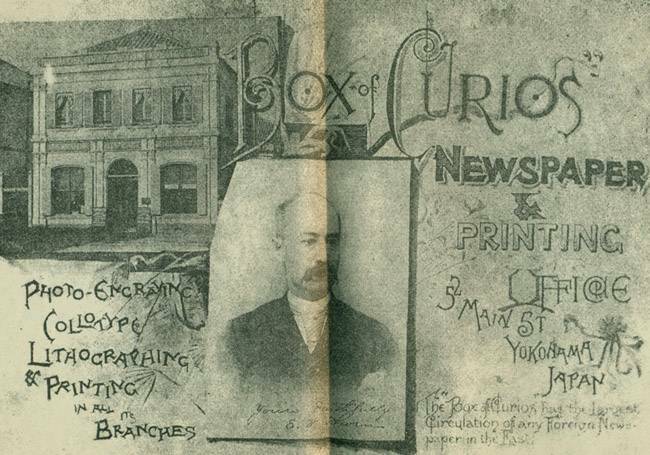 Manwaring, Manager, imprinted on front cover, 32mo (10.5 x 14 cm), stab ties, 65 pp + 18 pp + advertisements, fold out plan of Yokohama City at the back. 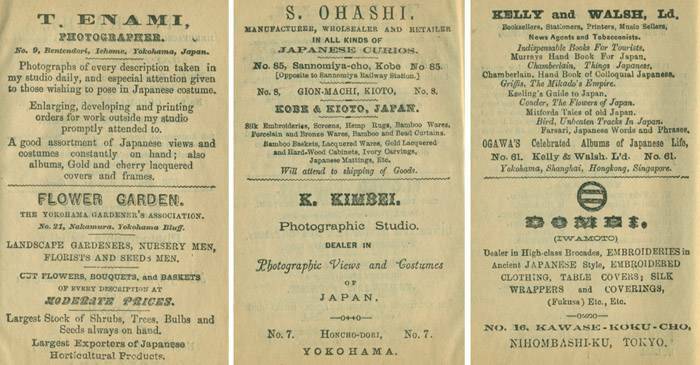 ca 1920, The Grand Hotel, Yokohama , Yokohama, Box of Curios Press, not dated but ca 1920, card wraps, silk stab ties, pamphlet size (3 1/2 x 6 1/2 in - 8.5 x 16.3 cm), orange vignette on title page which shows through a cut-out on the front cover, 5 black and white full page halftone illustrations and 8 small halftone illustrations in the text, unpaginated but 12 pages total including the title page and full page illustrations. More information here. 1865, Charles Wirgman's sketch of the Bund, where the Grand Hotel would eventually be located, after the Tsunami of 1865. Japan Punch. 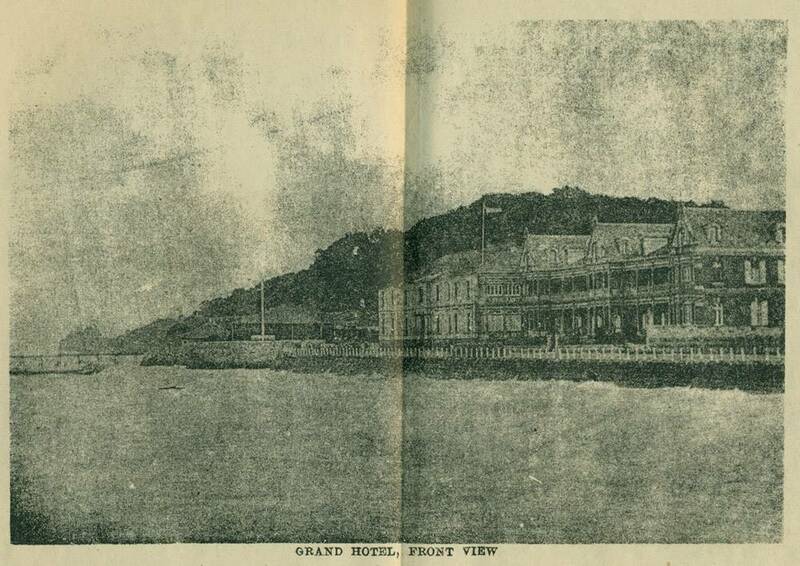 A page with a chronological presentation of images of the Grand Hotel is here. 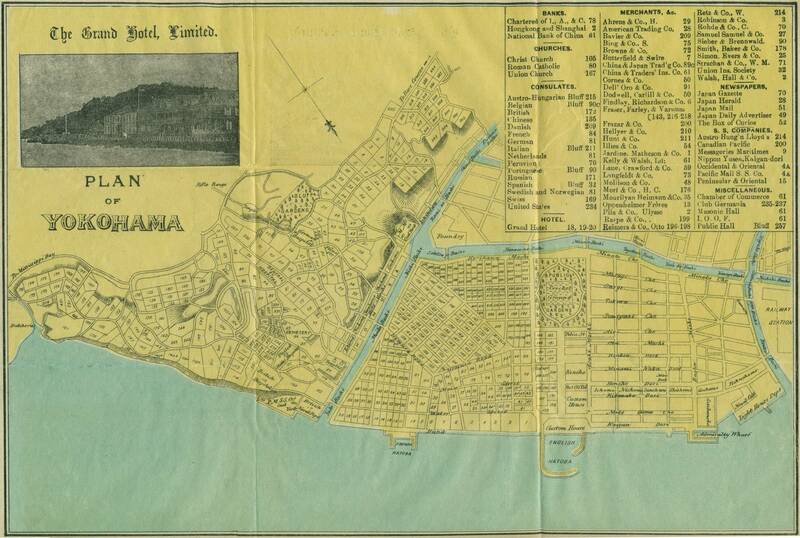 The US Naval Hospital was in the Bluff area which overlooked the Grand Hotel. 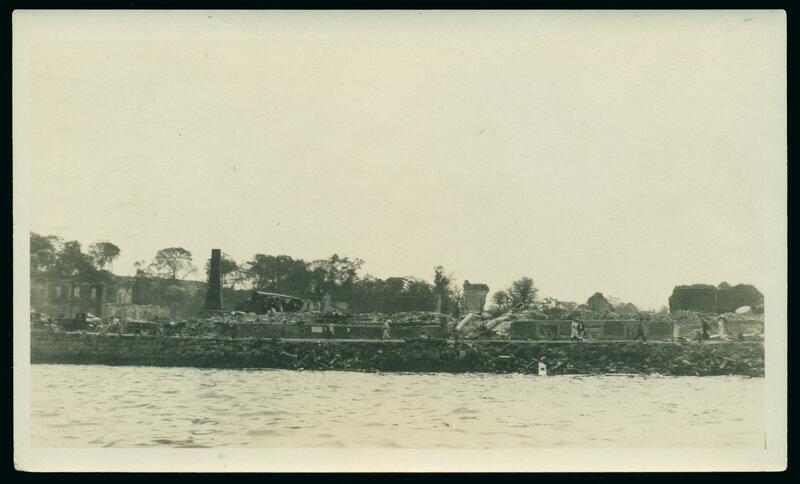 The Great Kanto Earthquake of 1923 destroyed almost all of the structures on the Bluff and in the foreign settlement where the Grand Hotel was located. For information on the US Naval Hospital, click here. Insert illustration is printed in halftone and is black and white.